The first edition had been out of print for years and it seemed that only the quick and lucky (and possibly wealthy) could buy a 2nd hand copy. From reading the periodic UKClimbing threads asking when the next edition would be published, I had the tantalising impression that the reason the second edition was still not available was because the author, Simon Panton, just kept finding more and more bouldering delights in North Wales that he could not leave out. 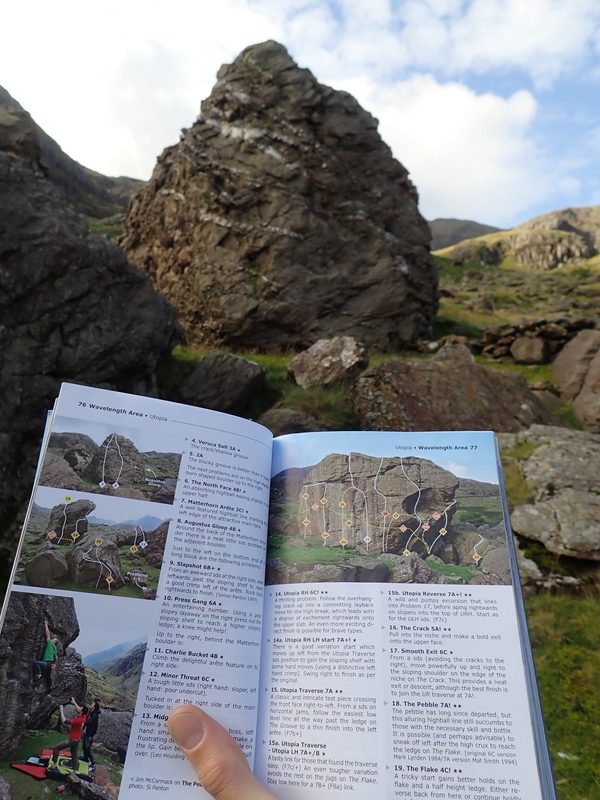 I had been making do with the bouldering sections in Climbers Club guidebooks and in Boulder Britain, but what they covered felt meagre compared to the amount of rock in North Wales. It felt like I was missing out because I just did not know where the best bouldering is. I was therefore delighted when I found out the new edition was coming and that I would have a chance to put it to use so soon. 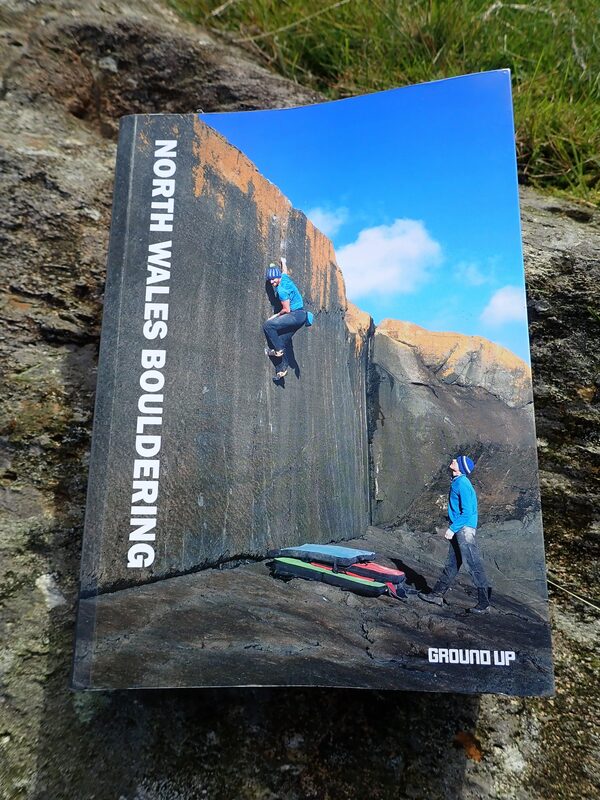 The North Wales Bouldering guidebook by Simon Panton and published by Ground Up Productions Ltd. When North Wales Bouldering arrived in the post it was obvious why it had taken so long to write and what an amazing achievement it is. It’s a huge 667 pages crammed with over 4,000 problems. There are so many problems in this guidebook that there isn’t space for an index and there is only a brief introduction with neatly summarised information. This guidebook includes the essentials of what you need to go bouldering and little else. One little extra that is included, and which I really like, are small sections spread throughout the book with information about the geology, natural environment and history of the area immediately around the bouldering. These are fascinating snippets that can give you a bit more perspective and understanding of the area you are climbing in. As these sections have the National Trust symbol next to them, I presume that this is who wrote them. Matt climbing an unnamed 4A problem on the RAC Boulders. 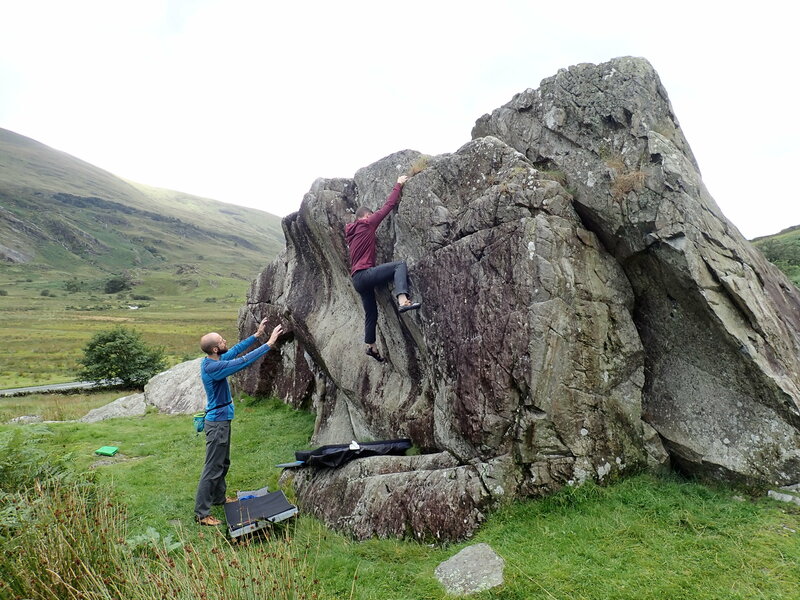 Like most climbing guidebooks, North Wales Bouldering is organised by broad geographic areas. Each area receives a brief description of the bouldering, approach and conditions as well as a clear, simple map. Each of these areas is then grouped into smaller bouldering areas that get similar descriptions but with slightly more detail. It’s a shame that there is no destination planner of the sort that feature in other guidebooks and which provide a neat summary of each bouldering area over a couple of pages. These make planning a climbing trip easier (particularly if you are just coming for the weekend) and would certainly help navigate this very large guidebook. Putting the North Wales Bouldering Guidebook (by Simon Panton and published by Ground Up Productions Ltd) to use at the Matterhorn Boulder in Llanberis Pass. The photos of the bouldering areas and the photo topos of the boulders themselves are excellent. Each problem also gets a good, succinct summary of the line. There are amazing and inspiring photos of bouldering throughout. The layout is also clear and easy to follow. 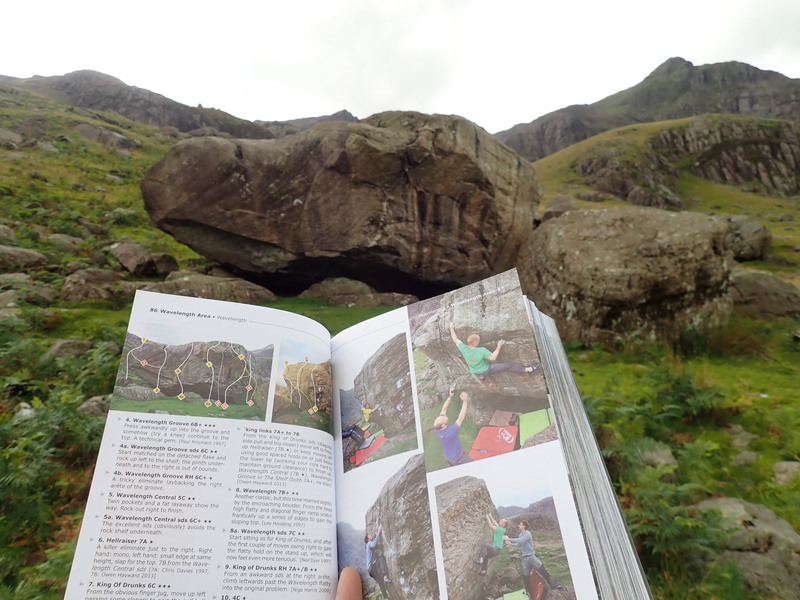 Putting the North Wales Bouldering Guidebook (by Simon Panton and published by Ground Up Productions Ltd) to use at the Wavelength Boulder in Llanberis Pass. I found using this guidebook last weekend both a joy and a bit of a disappointment. I discovered fun and interesting bouldering that I had never known about and would probably never have found out about without this guidebook. However, I also found that North Wales Bouldering can only give me a limited supply of this bouldering. This is because only a small proportion of the 4,000 problems in this book are at the easier grades that I currently boulder outside. There are few problems with the UK technical grades 3 and 4 and the lack of a destination planner or index means that you have to search through the book to find them. I’d have to study this guidebook in a lot more detail to be absolutely sure, but it feels like most of the easier problems described are at the RAC Boulders, in the Llanberis Pass and in the Ogwen Valley. Matt climbing an unnamed 3c problem on one of the Milestone Buttress Boulders in the Ogwen Valley. I’m disappointed that North Wales Bouldering doesn’t copy the format of books like Rockfax’s Peak Bouldering with its green circuits of easier problems. It’s possible that bouldering in North Wales is mostly hard stuff and so my disappointment should be about what is available rather than the contents of the book. 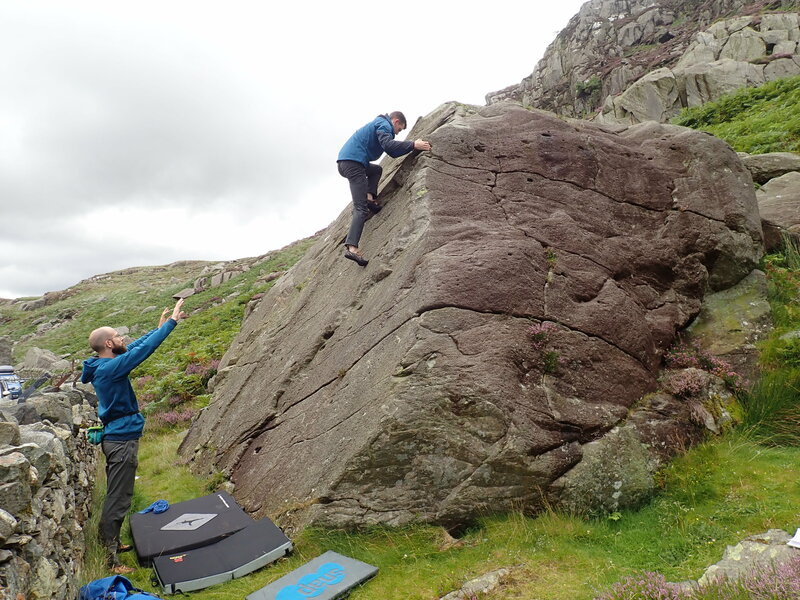 However, I’m sceptical that there is not more, easier bouldering available in such a large, rock-filled area as North Wales. Me climbing the problem Willy Wonka (3b) in the Wavelength Utopia area of the Llanberis Pass. 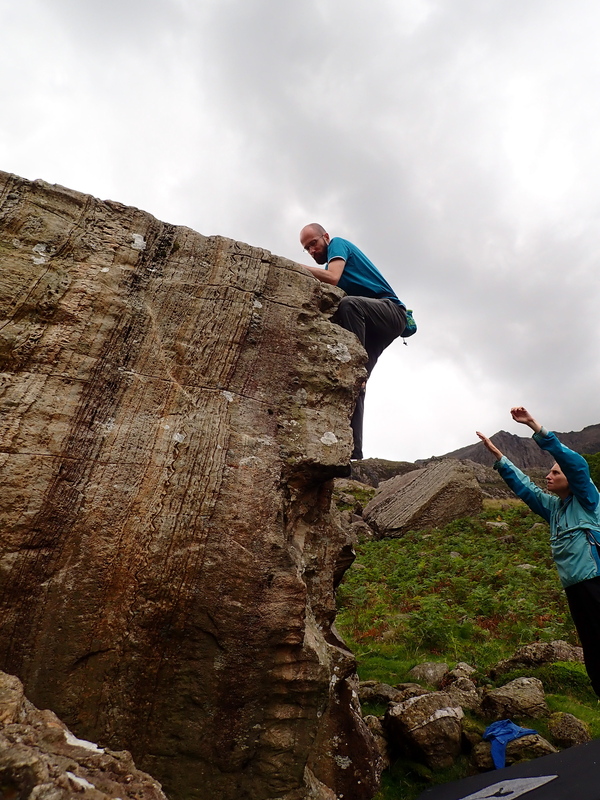 Perhaps strangely, my other disappointment of last weekend was that I didn’t get to use North Wales Bouldering more. It rained most of Saturday morning and so hung out in Llanberis waiting for the rain to stop. I then spent some time hunting around for places that weren’t getting the remaining showers and where there was enough dry rock to climb on. Thankfully, I did find places to boulder on Saturday while on Sunday it was dry and often sunny. 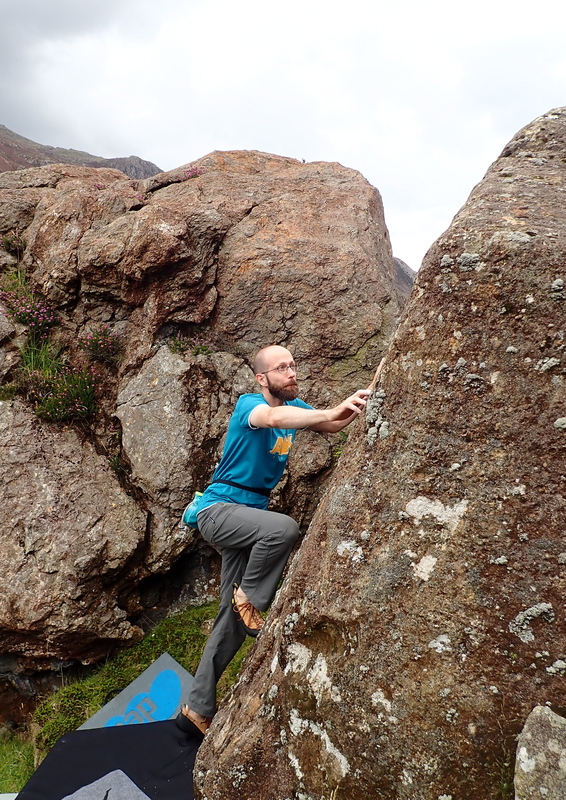 I ended up having a good weekend doing some great bouldering in some fantastic locations. I wouldn’t have had quite the same weekend without North Wales Bouldering and I’m really pleased that I have a copy. I want to put it to use again soon. The Llanberis Pass, with the Wavelength, Pieshop and Utopia boulders on the mountain side. I really, really must get back to Snowdonia – I’m in a climbing club there and haven’t been to the cottage for over 10 years now with all this Scottish stuff I’ve been doing. I have one single climbing friend and she also has a club hut in North Wales so I’d love to get her to take me climbing there – she sounds agreeable – I just have to get myself sorted and get down there! 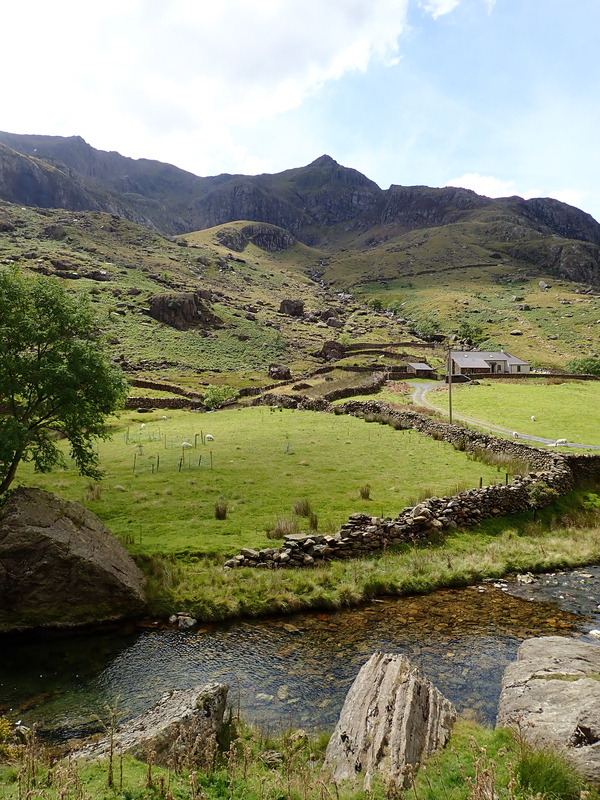 I love Snowdonia. A beautiful place and a great place to climb. It’s good that you have the opportunity to use a club hut. yes the hut is great, just under Snowdon and really cheap. Pretty much in the Llanberis Pass! Sounds like a perfect location. You definitely need to take advantage of it. Luckily I used to use it heavily – I just need to get back there now. It’s certainly good. It’s not too late to try it out. I just read some of your great posts and now I’m getting so curious about this bouldering stuff. I’ve never tried it before but I wanted to learn and take it day by day. Can you share any guides for first-timers like me? Thanks Emily. I’m pleased that you liked the posts. The best guide on bouldering that I know of is Bouldering Essentials by David Flanagan. It’s a well written book, with inspiring and useful photos. It also really does cover the essentials. Oh, I’ll check it out! Thank you so much for the help Robin!